The new Twenty-4 Automatic adopts the aesthetic appeal of the rectangular Twenty-4, first launched in 1999 and reflecting the idea that it was suited for any time of day or night, with an exclusive bracelet featuring gently cambered central links framed by delicate two-tier outside links. The Twenty-4 Automatic is available in five versions: two in steel with diamond-set bezels, two in rose gold with diamond-set bezels and one in rose gold with diamonds set in the bezel, the bracelet and the crown. The diamonds are flawless Top Wesselton grade to comply with the exacting standards of the company. Prices range from $26,083 to $56,702. 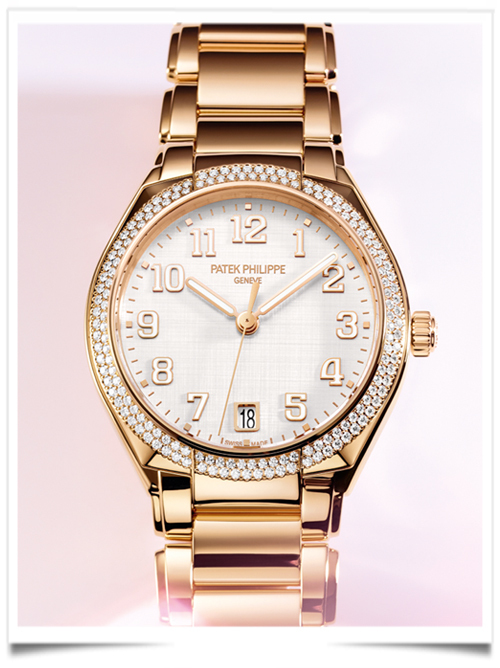 To convey the message of a modern and independent woman wearing the watch, Patek Philippe invested in a major international advertising campaign dedicated to the new design both in print and through online platforms.